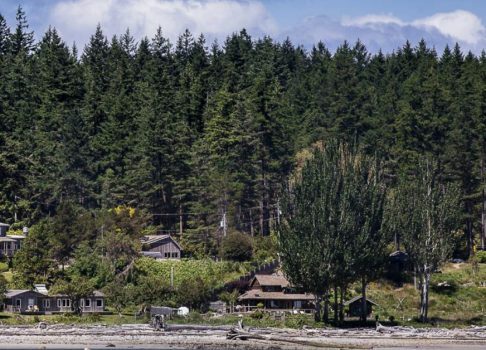 Join Vicki Robin at the beautiful Hollyhock Retreat Center to look at your individual – and our collective – relationship with money, from spirituality to spreadsheets, from practices to potential for change. Emerge clear, effective, light-hearted and honest about money, and with tools to set a firm financial foundation for whatever you want to do with your life. Put money in service to your values rather than your life in service to money! Transform your relationship with money through this radical, clear-eyed, compassionate, and systematic approach; redefining both your beliefs and behaviours. 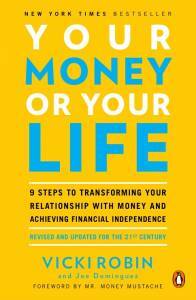 This is a rare opportunity to dig into the methods presented in the widely celebrated, bestselling book Your Money or Your Life: Transforming Your Relationship with Money and Achieving Financial Independence, co-authored by Vicki Robin and Joe Dominguez. What if we reimagined financial freedom from a pathway to personal empowerment to a framework for more justice and civics in our country? Join us March 5 for an evening with Vicki Robin, coauthor of the NYTimes bestseller, Your Money or Your Life and godmother to the FIRE (financial independence retire early) movement. Vicki sees the FIRE movement as full of potential to do some real good in the world with the time they liberate from paid employment. Vicki will tell us about FIforALL, her framework to guarantee financial security for all Americans, regardless of their station. She will invite us to imagine what our country would be like if everyone had their baseline material needs met. Join us for a fun and inspiring evening with one of America’s finest and most original minds. Be our guest tomorrow as Grant Sabatier, author of Financial Freedom and I talk about our 2 year partnership to bring transformational financial education to everyone. His book comes out today, February 5 and tomorrow, February 6 at 5 PM PST, we will be on a Facebook Live event to share ideas from both our books, mine a best-seller and his a best-seller to be. Grant and I welcome you into the free wheeling and deep conversations we’ve been having for 2 years. Click here to join the Facebook Live Event. If you can’t come, do check out his book. We both look forward to seeing you there! I’m thrilled to once again teach at the Sivananda Yoga Ashram from December 2-4, 2018 in the beautiful Bahamas. I give 4 talks and workshops over my 3 days residency, plus you eat amazing food and do all the yoga you want in the company of lovely human beings. Being on the edge of the warm clear turquoise ocean doesn’t hurt! Here’s the information and below is a video about the Ashram. These are the “interesting times” of the oft-quoted Chinese curse. Many are fearful of what the future holds. How do we relate to money in such a season of tectonic change? How do we stay with the changes, whatever our age, when the grounding points of the old American Dream are un-moored? What prospects do our young people have in this gig and sharing economy when jobs are outsourced to low wage countries and now robots? #FIforALL – an aspiration and a set of policies to transition out of the old American Dream and into the new landscape of work, purpose, identity, connections and enoughness. There will be ample time for questions and discussion, often the richest part of an evening. Books will be for sale at the event, and Vicki will be signing them. 1st Annual Food Tank Summit in Partnership with The George Washington University, Washington D.C. Vicki Robin joins more than 75 featured speakers from the food and agriculture field for this two-day event at the Jack Morton Auditorium. Researchers, farmers, chefs, policy makers, government officials, and students will come together for panels on topics including; food waste, urban agriculture, family farmers, farm workers, and more. Yoga for Peace: Changing the World from the Inside Out, Paradise Island, Nassau, Bahamas Vicki Robin will be speaking at the 8th Yoga for Peace Symposium, among fellow world-renowned speakers who have all, in their own way dedicated their lives to promoting peace and sustainability. The Economics of Happiness Conference Portland, Oregon Three days of plenaries, panels, interactive workshops and other participatory sessions to discuss, discover and devise better systems for now and the future. 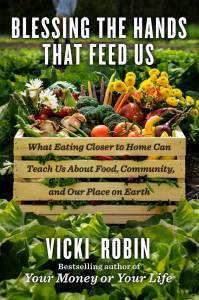 Join Vicki Robin, who will be speaking among other other thought leaders, in initiating conversation and action to build resilient communities, healthier ecosystems and equitable economies. Westerville Reads: 2nd Annual Community-wide Reading Program, Westerville, Ohio Vicki Robin’s Blessing the Hands that Feed Us has been chosen as Westerville Public Library’s featured title for 2014. More information HERE. Thursday, September 18 at 10am. As of January 2, here are the bookstores already confirmed. Lots of readings. Lots of work. Lots of networking. Lots of play. Lots of need for water and rest!